At some point, every medical device development company will encounter an issue that requires an investigation. Whether it’s due to a nonconformance, complaint, CAPA, or an audit issue, you’ll have to conduct a failure or root cause investigation so that you’re able to pinpoint why the issue occurred. For many people, the news that you need to conduct an investigation may be accompanied by a certain sense of dread. It’s never pleasant to think about the implications of anything going wrong with a medical device, but don’t let that put you off the heart of the matter. An investigation can be an excellent learning mechanism; an opportunity for your business to gain valuable insights that will serve you better moving forward. 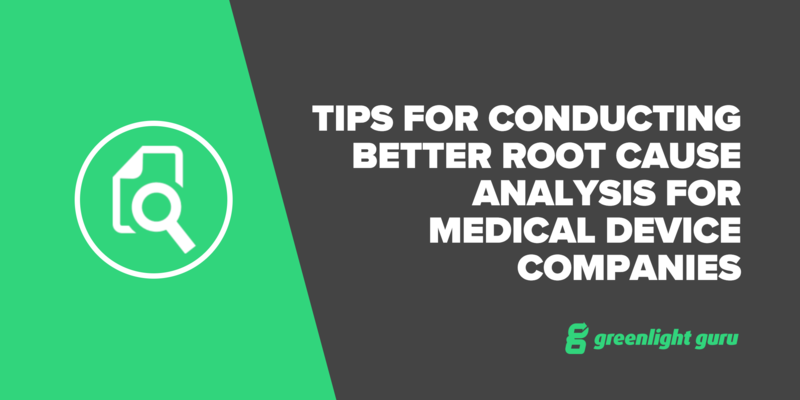 That being said, investigations can be a source of confusion for medical device companies, so we’re taking a look at a few tips on conducting root cause investigations and avoiding some common mistakes. Free Bonus Giveaway: Click here to download a free PDF version of this article, "Tips for Conducting Better Root Cause Analysis" to save for later or share with a colleague. We wrote a piece recently about whether or not an incident should trigger a CAPA, and as we discussed, not every issue should go down that road. However, any time there is an issue identified, it should trigger an investigation. Nonconformance issues (where there are issues with parts in manufacturing), audit findings, CAPAs, and complaints will all be trigger points for initiating an investigation; however, as we have previously pointed out, there is no need to open a new investigation if you already have one open for the same issue. An important point to ensure your company stays on the right side of compliance requirements is that all investigations should be well-documented as part of your overall Quality Management System. When you are audited, you will be required to provide evidence that you have documented procedures and that you follow them. An issue is identified, triggering an investigation. You determine the scope of the issue. How big is it? How many products and/or processes are affected? What types of notifications are required? Do you also need to put containment strategies in place, such as quarantine or recall? Conduct root cause analysis to get to the bottom of the issue. Put steps in place to correct and/or prevent the issue from occurring again. Failure Modes and Effects Analysis (FMEA) is a systematic method for evaluating a process. It can be used with the premise that a failure has already happened for which you’re trying to identify the cause and severity of the failure mode, or it can be used proactively. This would mean assuming a failure or evaluating a process to determine where it might fail, then taking steps to manage any parts of the process that are identified as prone to failure. We’ve described FMEA before as a reliability tool rather than a risk management system, and this is an important distinction to make, as we know some companies have used only FMEA. 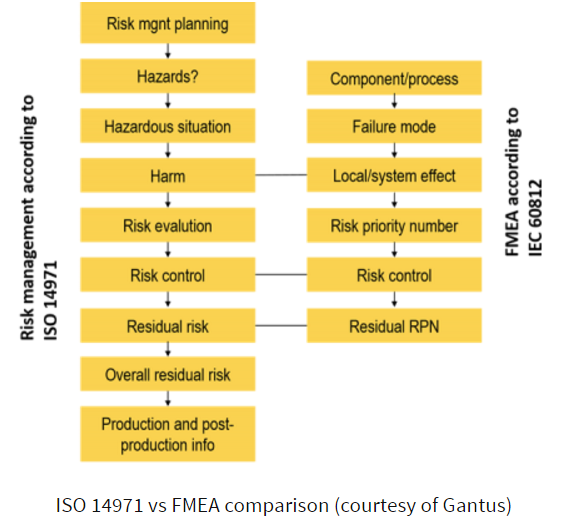 Its sole purpose is to uncover failure modes and as such, it does not take the place of a risk management system that follows ISO 14971 standards. ATL goes through the entire FMEA process here. It’s a particularly useful tool for proactive identification of issues during product development, but, as we’ve found, it’s not the best method where there are a chain of events that lead to a failure. A fishbone diagram begins with a “problem statement,” which is written at the mouth of the “fish.” This is often the first key hurdle for companies - you need to agree upon what that problem statement is. Next, you need to agree upon which major categories contribute to the problem. These are written as branches or bones off the main arrow. From there, you ask questions about causal factors of the problem, which are written as branches off the key categories. Asking “why” questions helps to keep narrowing down the cause. You might also find this method referred to as an Ishikawa Diagram or Cause and Effect diagram. “Five Whys” is a simple, yet often effective methodology. Basically, it’s a bit like talking to a toddler! You start out with the problem identified, then keep asking “why” questions until you’ve reached the bottom of the issue. This might take more or less than 5 “whys”, but the point is that you’ve identified the real root cause, rather than simply taking an early answer you arrive at. Problem: Component A keeps detaching from part B. Why is it detaching? Bolt Q is ⅛ inch too small. Why is Bolt Q ⅛ inch too small? Because Supplier Z sent us the wrong bolts. Why did Supplier Z send the wrong bolts? Because the wrong box was checked on a purchase order form. 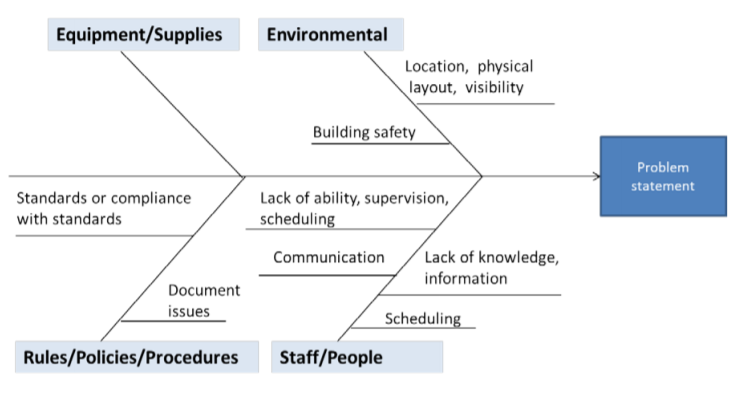 A fault tree is more of a top-down analysis that puts the problem at the top of the “tree” and takes a deductive approach to analysis, looking backwards at the causes of a failure. The end result is the starting point for your analysis and is traced back one step at a time to its immediate causes. Basically, you keep tracing back until those causes are identified. NASA also uses fault tree analysis (so it has to be good! ), and provide a detailed explanation for conducting one here. Don’t get hung up on the tool you use. Many businesses let the tool get in their own way by choosing a method that they are not familiar with, hampering them unnecessarily. Find something you can work with and stick with it. Overuse of FMEA is a common mistake. Usually, FMEA is very good if you’re trying to design your manufacturing process or have a singular event that could lead to a failure. If you try to use it to apply to the use of your product, there tend to just be too many variables. It usually requires a sequence of events to occur to lead to a failure when it comes to product use, whereas FMEA is better suited to single events. Methods, such as fault tree or fishbone, are better where there are a series of events involved. Start with the simpler tools if root cause analysis is new to you. We recommend fishbone or 5 whys as good methods to start with. Don’t investigate in isolation. A single person will come up with results directly dependent on their own experience. Bring in cross-functional resources to brainstorm - who else has knowledge? You match the urgency and scale of the investigation to the severity of the issue. You have documented procedures in place. You keep records of the investigation. You choose a method of root cause analysis that works for you and is a good fit with the issue. It doesn’t have to be an intimidating task to carry out an investigation. Use the tools you are comfortable with, get input from other team members and resources, clearly determine root causes, and treat the exercise as a valuable learning experience for your company.